I've turned the volume knob all the way up but still find the speaker volume is far too low and difficult to hear. Please check if your system or messaging app volume is set to too low. 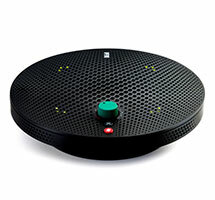 You can increase the volume to mid or high and adjust the green knob on VX-1 to find a clear volume for your conferencing need. Please also check if the remote party is having the microphone recording volume set to too low. If so, please ask them to increase record volume or turn on microphone gain. The person I am calling cannot hear me. 1. Your microphone is set to Mute. If the LED indicators on VX-1 are red then your Microphones are currently muted. Press the red mute button to unmute. If the indicators are green please check to see that your microphone has not been muted on your iDevice or Computer. 3. The person you are calling has set their speaker volume too low. Please ask them to increase the speaker volume. 4. Make sure you have selected VX-1’s microphone as the active microphone in your software or application (PC/Mac only). 5. Your microphone sensitivity is set to low. Please adjust the microphone sensitivity to high. VX-1’s default microphone sensitivity is set to high, so you should only need to adjust sensitivity if you have adjusted it before (PC/Mac only). 1. The speaker is on Mute. Please check your Computer or iDevice settings to make sure you have not selected mute. 2. The person you are calling has their microphone on mute. Please ask them to unmute their microphone. 3. The speaker volume is set too low, please increase the volume. You can do this by turning the Green knob clockwise or by adjusting the volume on your Computer/iDevice. 4. The person you are calling has their microphone sensitivity set to low. Please ask them to set their microphone sensitivity to high. 5. Make sure you have selected VX-1’s speaker as the active speaker in your software or application (PC/Mac only). If my Computer and iDevice are both plugged into VX-1, can I make calls using my Computer? No. VX-1 will automatically switch to your iDevice if you have plugged in the 3.5mm audio cable. If you wish to use your Computer to make calls please unplug the 3.5mm audio cable from VX-1. Does VX-1 remember my Mic settings? VX-1 will remember which Mic setting was selected before you pressed mute and will revert to the previous setting when you unmute. However, VX-1 will only remember your mic settings for the current session. Why is the sound quality better when making calls using the internet/WiFi versus making calls using a cellphone network? When you use the internet to make a call the sound sampling rate is higher (16k Hz) than when you make a call using a cellphone network (8K Hz). This is why sound quality is better when you call using the internet. The reason for the low sampling rate is because when you make a call through your cellphone network it passes through the public switched telephone network (PSTN), to save bandwidth they lower the sampling rate. What type of USB AC adaptor can I use with VX-1? VX-1 needs an adaptor with a rating of at least 5V/500mA. As long as your AC adaptor’s rating is the same or more (e.g. 5V/1A, 5V/2.1A) they are compatible with VX-1. If you have an iDevice, your iDevice AC adaptor is also compatible with VX-1. When powering on VX-1 the LEDs flash a few times and stop. Is this normal? Yes. When VX-1 powers on, it has to communicate internally with 3 IC chips. When it has finished communicating, the blinking will stop, then VX-1 is ready to be used.